The Mitsubishi Electric Championship at Hualālai held January 17-19, 2019 ended at the last hole with a par from Tom Lehman who came from behind, birding holes 13, 14 & 16, which left him even with the leader, David Toms. Lehman’s par at hole 18 gave him a -17 and David Toms finished with -16. 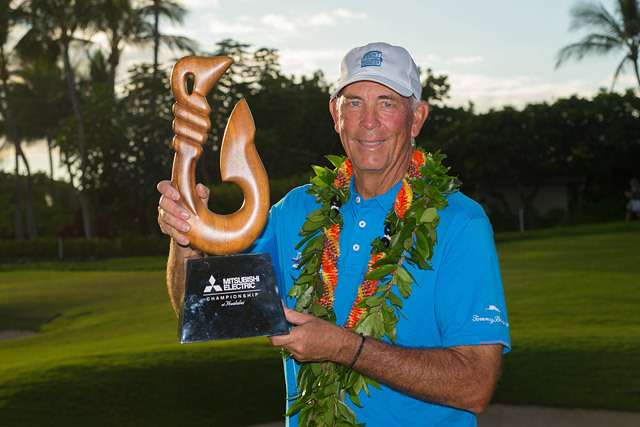 This was Tom Lehman’s first win in the islands. Other notable scores were Jerry Kelly, last year’s winner, at -14 and Bernard Langer at -14, Mitsubishi Electric Championship at Hualālai winner in 2009, 2014 and 2017. The spectators were treated to beautiful blue skies, whales breaching and great golf from the players. The two day pro-am was held January 15-16 which benefits the Hualālai ‘Ohana Foundation, Big Island Jr. Golf Association, Rotary Club of Kona, and Daniel R. Sayre Foundation. The PGA Tour Champions and Mitsubishi Electric look forward to opening the Champions Tour in Hawai‘i at Hualālai Resort, which has been here every year since 1997. The Rotary Club of Kona, which helps with arranging the many volunteers that make this event a successful tournament, along with the staff and management of the resort. The Daniel R. Sayre Foundaton which helps with purchasing rescue equipment for our Fire Fighters and the Big Island Jr. Golf Association. A number of our Champions also participate in other tournaments on island to help raise money for the Hawai‘i State Jr. Golf Association. These organizations truly appreciate your support and without the spectators this tournament would not be complete.